Some of the students and faculty who presented research and posters at the American Speech Language Hearing Association Convention in Boston. The American Speech Language Hearing Association Convention is the premier professional development event for speech-language pathologists, audiologists, and speech, language and hearing scientists. More than 18,000 attendees gathered in Boston this past week to learn and discuss current research and recommended best practices. 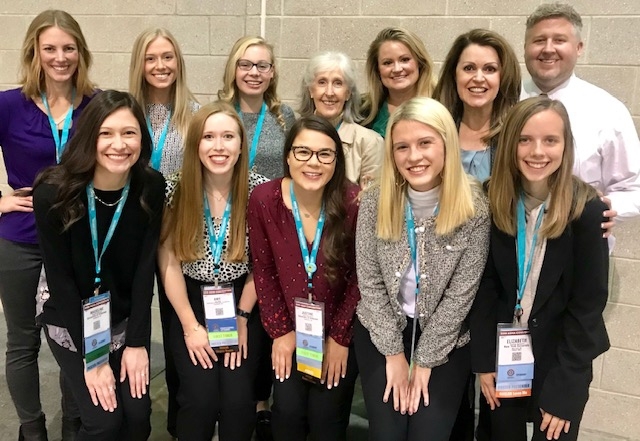 Faculty and students from the Communication Disorders Program at the University of Arkansas were well represented at this conference. Several students' presentations were designated ASHA (Promoting the next Generation of Researchers) PROGENY presenters. A list of presentations and designations are provided below. "Deception and theory of mind in typically developing children and children with autism"
"Investigating grit in young children: Is technology the new marshmallow"
"Perceptions and experiences of bullying by adolescents with hearing loss"
"Phonological working memory in older and young adult populations"
"Professional perspectives: Parent coaching training in communication disorders programs"
"Spectral power in the resting-state and working memory load in adults who stutter and controls"
"The use of otoacoustic emissions with preschool, second-language learner population"
"When feeding doesn't work: The impact of failure to thrive on maternal self-attribution"
"Comparative effects of picture symbols and color photos on engagement in children with multiple disabilities"
"Professional perspectives of aural rehabilitation for adults with cochlear implants"
"Pre-professional preparation for parent coaching"
"Scaffolding partner-oriented dyadic and triadic gaze from students with multiple disabilities and limited engagement"
Michael Hevel, chair of the Department of Rehabilitation, Human Resources and Communication Disorders, made the trip to Boston to support students and faculty. Additionally nine undergraduate honors students presented their research projects. Presentations were well received and students and faculty are already hard at work preparing for next year's conference to be in Orlando, Florida.